DEAR MAYO CLINIC: What causes tonsil stones? Is there a way to permanently get rid of them, other than having my tonsils removed? I am 48 and have heard that having a tonsillectomy as an adult is a significant surgery that can lead to other problems. ANSWER: Tonsil stones form when substances become logged in the crevices of your tonsils. If you are prone to tonsil stones, having your tonsils removed is the most effective way to solve the problem. If, however, you prefer not to do that, there are ways you can safely remove tonsil stones. There also are self-care steps you can take to help prevent them from coming back. Your tonsils are two oval-shaped pads of tissue at the back of your throat, one on each side. The tonsils are a type of lymph node and work as part of your body’s immune system. They act as filters for bacteria and viruses. They also make disease-fighting white blood cells and antibodies. The tonsils’ surfaces are irregular. Some people have pits and craters in their tonsils that are deep enough for food particles, bacteria, saliva or mucus to become caught in them. As these substances are pressed into the craters, they eventually develop into tonsil stones. Also called tonsilliths or tonsil calculi, these stones typically are pastel yellow in appearance. You might be able to see the stones when you examine your tonsils. But if they form deep in the tonsillar tissue, the stones may not be visible. Common signs and symptoms of tonsil stones are tonsil redness and irritation. These stones also frequently cause bad breath due to the bacteria that collect on them. 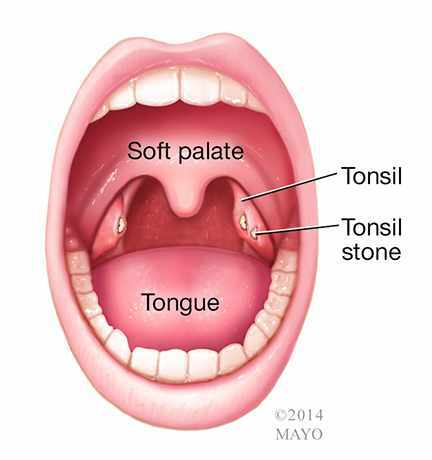 In some cases, tonsil stones can lead to chronic tonsil inflammation or infection of your tonsils, called tonsillitis. But in many cases, they are simply a nuisance. If you have a history of developing tonsil stones, the best way to get rid of them permanently is to remove your tonsils. Surgery to take out the tonsils is called a tonsillectomy. It is usually done as an outpatient procedure, so you don’t have to stay overnight in the hospital. As with all surgeries, it carries some risks, such as bleeding after surgery. Most people have throat pain after a tonsillectomy. But the pain often can be effectively managed with medications, along with plenty of fluids and rest. If your doctor recommends against a tonsillectomy due to your medical history, age or other factors, or if you simply would rather not have your tonsils removed, you can take other steps to deal with tonsil stones. When stones form, you can remove them either by gently pressing them out with a cotton swab or the back of your tooth brush, or by washing them out with a low-pressure water irrigator. You can use this device to aim a gentle stream of water at the tonsil craters and rinse out debris that may be caught in them. You can help prevent tonsil stones from forming in the first place by following good oral hygiene. Brush your teeth after meals, at bedtime, and when you get up in the morning. When you brush your teeth, gently brush your tongue, as well. Floss your teeth daily. Regularly use mouthwash that does not have an alcohol base. These techniques can lower the amount of bacteria in your mouth that may contribute to the development of tonsil stones. If tonsil soreness persists, if your tonsils look very red or bleed easily, or if pain from your tonsils extends to your ear, make an appointment to see your doctor. These symptoms could signal a more serious problem that may require medical attention. — Ann Bell, M.D., Otorhinolaryngology, Mayo Clinic, Rochester, Minn.